John Curtin wanted a house entirely surrounded by verandahs that he could walk around as he composed speeches. In 1923, the Curtins purchased land in nearby Jarrad Street, then just a gravel road surrounded by bush. Eventually, the house was built with verandahs on three sides, but, as it filled up with family members, these were gradually built in to create more bedrooms and a larger sitting room/study to house their significant book collection and Elsie's piano, which she had purchased soon after her marriage. John Curtin Junior's early memories were of a house backing onto paddocks filled with trees and wildlife, where he and his mates used to play cowboys and Indians. They also built a speedway for their bikes, carefully screened by trees from parental eyes. In January 1929, Elsie's brother, Leslie, arrived from South Africa for a holiday, prior to taking up an appointment as organist at St. Matthias' Church in Paddington. Apart from his church duties, he gave public organ recitals in metropolitan and country churches. 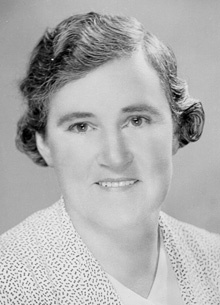 Although Elsie maintained an active role in the Labor Women's Organisation, her main commitment was to her husband and family, which meant being available when they needed her. Life with John – especially when the children were young – was often difficult, although Elsie was far too loyal to admit this. In 1919, after an unsuccessful attempt to enter politics, standing as Labor candidate for the seat of Perth, coupled with personal grief over the deaths, in short succession, of both his father and his closest friend, Frank Hyett, John suffered a mental collapse, lapsing into severe depression for several months. Abraham Needham helped out by writing polemical editorials for the Worker, when John was unable to fulfil his duties at the paper. This was a time of crisis, but although it passed, John's bouts of depression and his battles to overcome alcoholism continued. Despite promising to give up alcohol when he married Elsie and when he took the job at the Westralian Worker, it is evident that he continued drinking at least until 1931 and possibly 1935. Why else would his colleagues have taken the trouble to ascertain whether he would 'stay sober' 34 before asking him to stand as ALP Leader when Scullin decided to retire? In preparation for the 1931 election, the family folder delivered election leaflets around the Fremantle electorate. When Curtin lost his seat in Labor's crushing electoral defeat, he relapsed into depression and alcoholism. Elsie seemed to take the defeat in her stride, despite suddenly finding herself the wife of an unemployed man. Black suggests that this was partly because John's drinking problem was 'much less obvious' when he was a private citizen. In 1928, when he couldn't decide between journalism and politics, it was Elsie Curtin who gave her husband the decisive initiative with her simple, "You were meant for Parliament." Later, when Curtin was defeated in 1931, his wife – "Nippy" as he affectionately calls her – again came to his aid with consoling words. "Never mind," she said, this means nothing. You'll be back in parliament again." And three years later, he was. [John Curtin's] political zeal might have faltered, however, when in 1931 he lost his seat in the Federal Parliament of Australia. The Western Australian Government offered him an attractive permanent job and, when he talked it over with his wife – because he believed a wife earns half a man's salary – she advised him to stick to politics where his heart was. Consequently, she might have added 'counsellor', if not 'prophet', to the home making skills she was prepared to acknowledge. 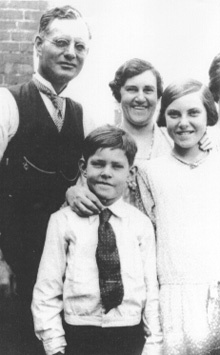 John and Elsie Curtin with their children, Melbourne, 1928. 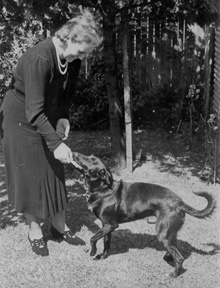 Mrs Elsie Curtin with "Kip" the dog, 1941. 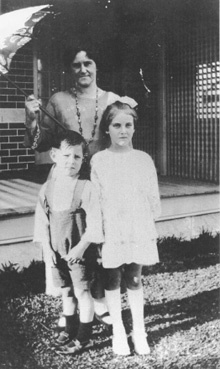 Elsie Curtin with John and Elsie, 1925.